SNOT BAD: Cunningham Pier has again provided top fishing for snotty trevalla. With the past week bringing some of the harshest winter conditions many anglers would have encountered, anyone lucky enough to have banked a fish certainly earned their catch. As has been the case for the past few months, Corio Bay thankfully proved some limited relief from the weather. Snotty trevlla and mullet remained present in vast numbers along Cunningham Pier, while Australian salmon were taken at times on soft plastics like Berkley three-inch minnows worked along the bottom. 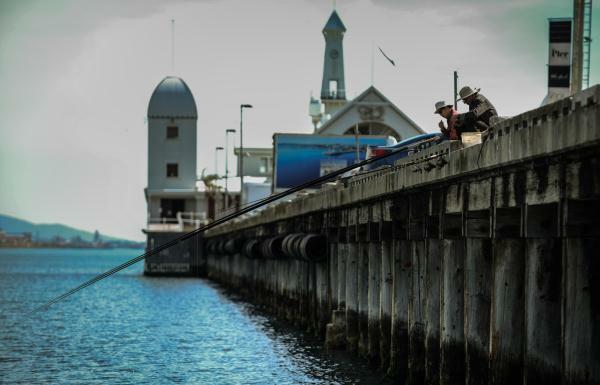 The Bellarine Peninsula hosted some squid action, with the Queenscliff Harbour giving up reasonable numbers for anglers casting size-three jigs. Point Lonsdale Pier again produced large salmon to almost 3kg on both bait and lure during the last of the run-in tide. The Barwon River estuary was another location where anglers could find shelter, with fishos going to the effort of sourcing fresh bait taking the odd mulloway. On the freshwater front, Lakes Purrumbete and Bullen Merri were on fire with a mixture of trout species. Rainbow and brown trout and Chinook salmon snapped up lures flat-line trolled at first and last light. Fishing Powerbait from the shoreline at Bullen Merri was a sure bet, accounting for catches of Chinook salmon and rainbow trout to 2kg. Closer to home, Highton’s St Augustine’s Waterhole was a fantastic option for the kids. Plenty of feisty stocked rainbow trout were taken on Powerbait and Rapala f-5 lures. Stony Creek Reservoir also provided some shelter. Anglers casting spoon-type lures banked rainbow trout to 1kg. With the next week’s weather forecast to be dramatically improved, anglers should keep an eye on St Leonards for both whiting and squid. Tuna are sure to pop up down around Portland, while this time of year usually features large brown trout on the move around Wurdiboluc Reservoir, where casting large hard-body lures often ends with the capture of trophy fish.